The Ultra HD "4K" TVs and computer monitors are a-comin'! But pushing that many pixels places is a mighty big strain on the cables used to transfer audio and video to your displays. In fact, while the HDMI cords used today are technically capable of handling 4K video, it can only do so at 24 to 30 frames per second, depending on the exact resolution. Meh. No more! HDMI 2.0 was announced Wednesday morning, with a big fat 18 gigabits-per-second data pipe—nearly double the 10.2Gbps that current HDMI 1.4 cords offer—capable of displaying 3,840-by-2,160 video at a glorious 60 FPS. Support for 21:9 widescreen aspect ratios is also included in HDMI 2.0, along with a newfound ability to deliver dual video streams on the same screen. The improvements don't stop with video, though. HDMI packs support for a whopping 32 audio channels, up from the 8 available in previous versions, along with "dynamic auto lip-sync" and support for additional CEC extentions (for better "one remote to rule them all" capabilities.) Audiophiles will be happy to hear (get it?) that HDMI 2.0's audio sampling goes up to 1536kHz, and the new spec can deliver up to four multi-stream audio channels to multiple users simultaneously. The spec also rocks all the features found in previous iterations, such as 3D video support and audio return channel capabilities. 4K displays sure are pretty, and now they're better supported by HDMI. All the changes add up to a pretty spiffy package, but the best thing about HDMI 2.0 is what hasn't changed: The physical design of the HDMI connection. 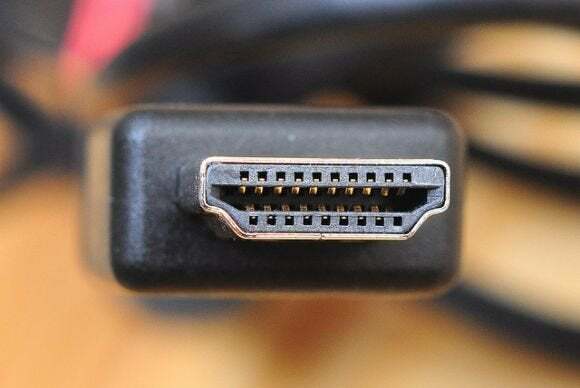 Yes, HDMI 2.0 is backwards compatible with current cords, though the HDMI Licensing group says you'll need to use high-speed "Category 2" cables to fully embrace those 4K-pumping speeds. Hardware manufacturers can roll HDMI 2.0 out to existing devices via firmware or hardware updates, though ExtremeTech claims upgrading gear from HDMI 1.4 will be difficult—so don't expect to see firmware updates pushed out for hardware that isn't specifically designed for 4K usage. HDMI 2.0 is actually fashionably late to the 4K party, as the spec was supposed to be released last year before running into delays. But that delay didn't mean much to most consumers. While 4K televisions are starting to creep down to merely "ridiculously expensive" from their previous "outrageously expensive" price points, the technology still has a long road to widespread adoption ahead, and the first 4K computer monitors are just beginning to roll out.